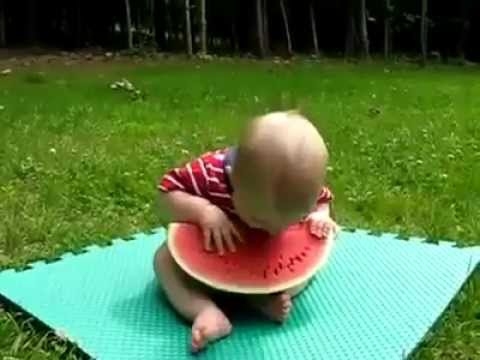 Watermelon for Babies: Good or Bad? 3 What If Your Kids Get Allergic? Watermelon is a succulent and wholesome fruit, and is endowed with a range of vitamins and antioxidants, which can keep you hydrated and refreshed, especially in the summer season. Additionally, the fruit is a perfect alternative to carbonated soft drinks as well as sweetened fruit juices. But do you know how can babies benefit from watermelons? As babies grow, their taste-buds evolve and a variety of foods can be added into their diets. So, you can offer watermelons to your kids as a wholesome snack, and chances are that they might take to it. Once your kid is about half-a-year old, you can start feeding him or her watermelon. Since watermelon has a high water content (nearly 93%), consuming the fruit, especially during summer season, helps in maintaining the water level and prevents dehydration. You can offer your kid slices or puree of watermelon. Watermelons have very high proportions of vitamin C -- every 100g of the fruit containing approximately 8.1mg of the vitamin. Vitamin C helps in boosting immunity and promotes iron absorption that results in the development of hemoglobin in erythrocytes (red blood cells). 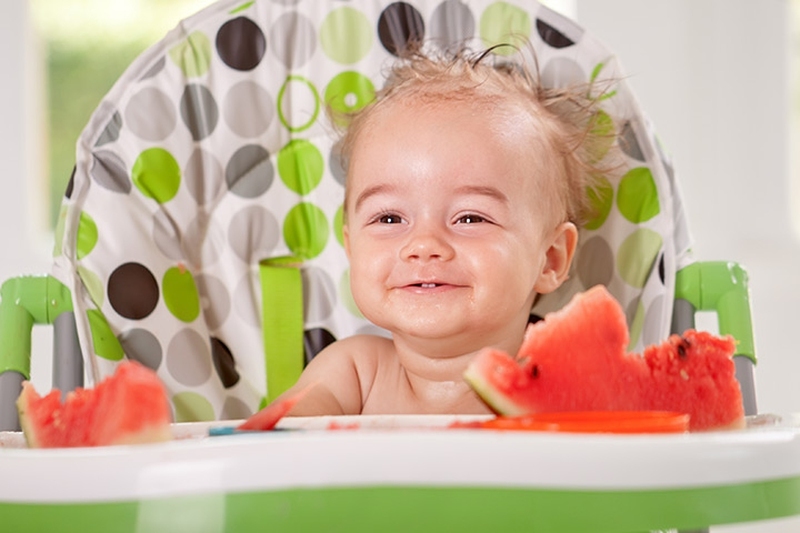 Watermelon for babies is beneficial because it is also rich in vitamin A and beta-carotene. These vitamin variants are essential for the growth and development of teeth, maintenance of keen eyesight, and healthy skin. Your baby needs enough minerals as he or she grows up. Calcium and magnesium are required for teeth and bone development; calcium helps promote hormone secretion; and magnesium is needed for smooth nerve functioning and muscle growth. And all these nutrients can be found in watermelons. Watermelons are infused with vitamin B complex which essentially comprises a suite of variant vitamins like thiamine, riboflavin, niacin, pantothenic acid, and vitamin B6. These vitamins have a range of health benefits including carbohydrate and protein metabolism, reinforcement of the immune system, development of the nervous system, growth of red blood cells, etc. Carotenoids are useful for upholding one’s cardiovascular health and keeping vision intact. For example, lycopene, an antioxidant which lends to the freshness of watermelons and the characteristic red color, is instrumental in arresting and/or delaying the onset of degenerative diseases. Besides, carotenoids like phytofluene, neurosporene, lutein, phytoene, and beta-carotene are also found in watermelons. You have to wait for your kid to grow old enough so that he or she is capable of digesting the fruit. Though the right time to introduce watermelons to little ones depends on the development of their digestive system, the opportune age is between 8-10 months. Consider thoroughly before feeding your baby on watermelon. For instance, has your baby grown sufficient teeth that’ll help to chew solids? Does your baby have the habit of chewing food completely prior to swallowing? When considering watermelon for babies, always go for fresh ones on the market and purchase the entire fruit, instead of buying prepared fruit cuts. Pre-cut fruits are vulnerable to contamination and infection. Cut a section off the fruit and store the rest in the fridge after enveloping it with polythene jacket. Make sure that the refrigerated section has attained room temperature before serving it to prevent kids from catching a cold. What If Your Kids Get Allergic? Be careful while feeding watermelons to your child and lookout for any symptom or sign of allergic reaction. Although watermelons rarely cause allergies in babies and are practically safe, it would be better for you to watch out for allergic reaction at least for three days after offering the fruit for the first time. If you’re giving watermelons along with some other kind of food, then ensure that the fruit is paired with foods that your kid has taken in the past. So, if there is an allergic reaction, you’ll be more or less certain the reaction was caused by watermelon. Signs of watermelon reaction may include rashes on the skin, inflammation due to high acidic content and itchiness of the skin. Besides, dizziness, runny nose, diarrhea, and vomiting are also usual signs of allergy. Seek a pediatrician if you notice these signs happen to your baby after consuming watermelon. As most babies tend to swallow without chewing properly, cut watermelon slices into very small cuts and pieces to minimize choking risks. Removing seeds and pulverizing or making watermelon pulp also help in preventing choking. In order to prevent choking, you might be tempted to offer watermelon juice to your kid. And that is something not recommended by physicians. Fruit juices owing to their chemical composition may cause dental cavities in children. So the best way to give watermelon for babies is to cut it into small cubes or make it into puree.